CCI products are generated for the five Greenland Ice Sheet Essential Climate Variables (ECVs). We invite you to download our datasets! The surface elevation change (SEC) is directly linked to mass balance of the ice sheet. The surface elevation change is a direct measure of the imbalance between the atmospheric forcing and ice sheet dynamics. Hence, identified as an essential climate variable, SEC is derived from present and past ESA radar altimetry missions. The era of ESA altimetry missions was initiated with ERS-1 in 1992, and data from ERS-2, Envisat and CryoSat-2 have contributed to an unbroken time series from then to present. 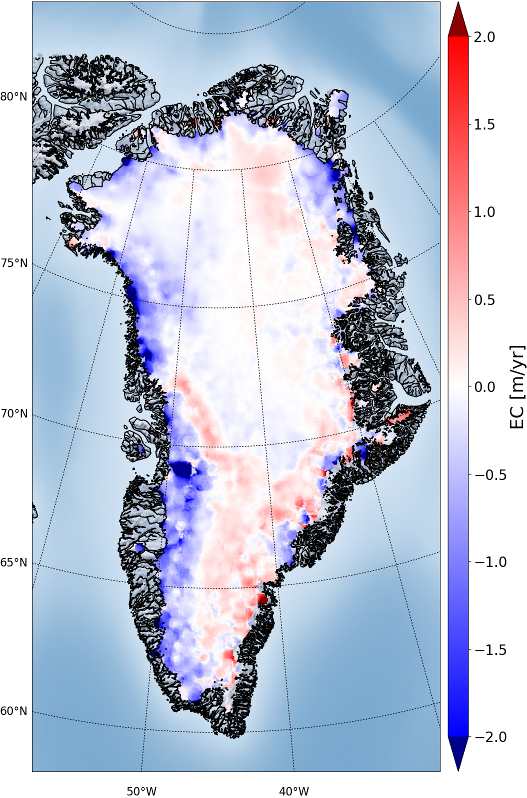 At present we have two ESA missions contributing with data for the Greenland ice sheet; Cryosat-2 and Sentinel-3a/b ensuring the time series to be continued. The nature of the radar measurements enables surface penetration in the interior parts of the Greenland ice sheet and the radar measures a reflecting surface within the upper 2 meters of the snow cover, rather than the snow-air interface. 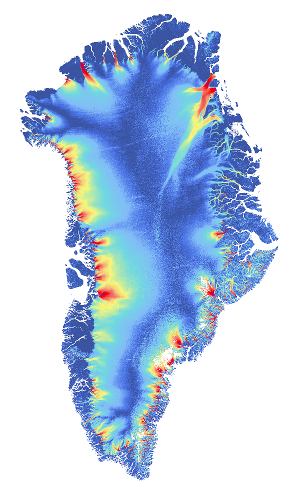 As a by-product of the work on SEC products, also a Digital Elevation Model for Greenland (GrIS DEM) has been generated. Glacier velocity and its spatial derivative strain rate (which is a measure of the ice deformation rate) are key variables for estimating e.g. ice discharge and mass balance and are essential input for glacier models that try to quantify ice dynamical processes. Changes in velocity and velocity gradients can point at changing boundary conditions. 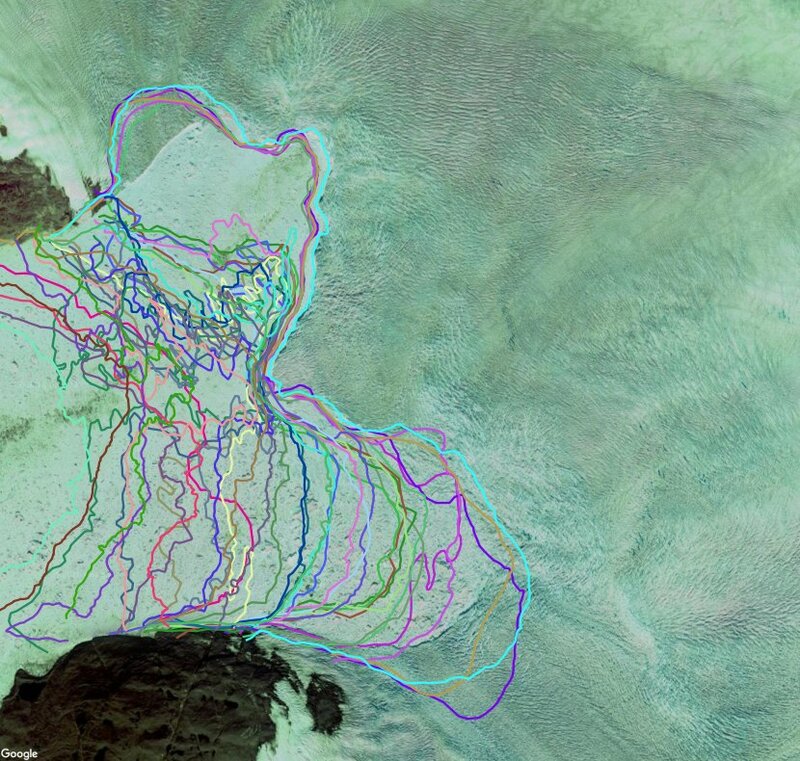 Remote sensing techniques that utilize SAR and optical satellite data are the only feasible manner to derive accurate surface velocities of the remote Greenland glaciers on a regular basis. The ice velocity (IV) products generated in the Greenland Ice Sheet CCI are derived from both optical and SAR data using combinations of different techniques. Details of the methods are provided in the Algorithm Theoretical Basis Document (ATBD). Ice velocity is provided as gridded velocity fields (maps) in NetCDF format with separate files for x and y velocity components (in m/yr). The velocity represents a mean velocity value over a time period ranging from the time span of the satellite repeat-cycle (between 1 to 46 days) to a full season or year for the ice sheet wide velocity maps. The Calving Front Location (CFL) of outlet glaciers from ice sheets is a basic parameter for ice dynamic modelling, computing mass fluxes and for mapping glacier area change. From the ice velocity at the calving front and a time sequence of Calving Front Locations the iceberg production rate can be computed which is of relevance for estimating the export of ice mass to the ocean. The calving front location is derived by manual delineation using SAR and optical satellite data. The digitized calving front is stored as vector lines in standard GIS format. Additionally, metadata information on the sensor and processing steps are stored in the corresponding attribute table. In accordance with the URD, the vector files are provided in ESRI shape-file format. The grounding line location (GLL) marks the position of where a marine terminating glacier starts to float. Understanding the processes at the grounding line of outlet glaciers is important in order to predict the response of the ice to changing boundary conditions and to establish realistic future scenarios in response to climate change. 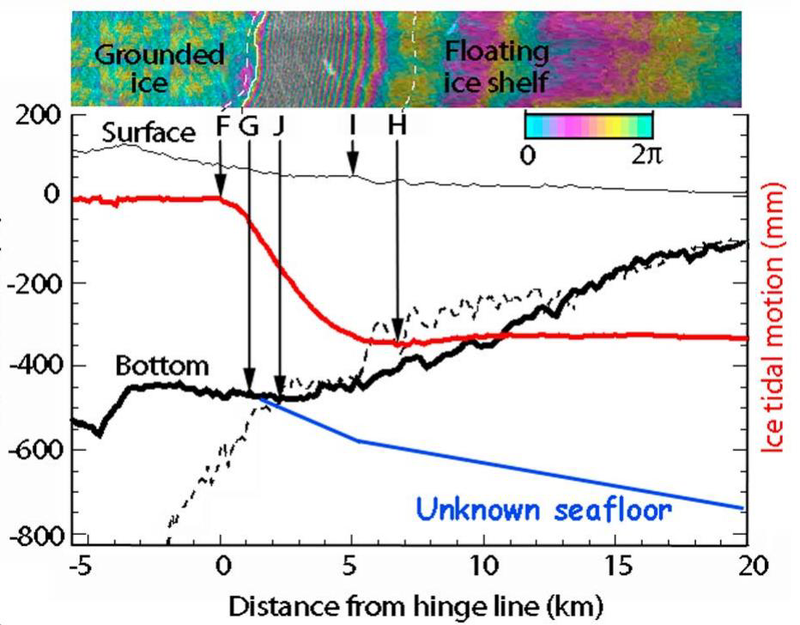 Remote sensing observations do not provide direct measurements of the grounding line position but can be used to detect the tidal flexure zone, using InSAR data, or spatial changes in texture and shading, using optical images, which are indicators of the transition from grounded to floating ice. Due to the plasticity of ice these indicators usually spread out over a zone upstream and downstream of the actual grounding line also called the grounding zone. In the Greenland Ice Sheet CCI the grounding line location is derived from InSAR data by mapping the tidal flexure zone visible in interferograms. It is generated for selected glaciers with a floating ice tongue. The Gravity Recovery and Climate Experiment (GRACE) twin satellites have been measuring changes in the Earth’s gravitational field since 2002. Time-variable gravity fields can be used to infer mass changes and mass redistributions in the Earth’s subsystems (e.g. the cryosphere). 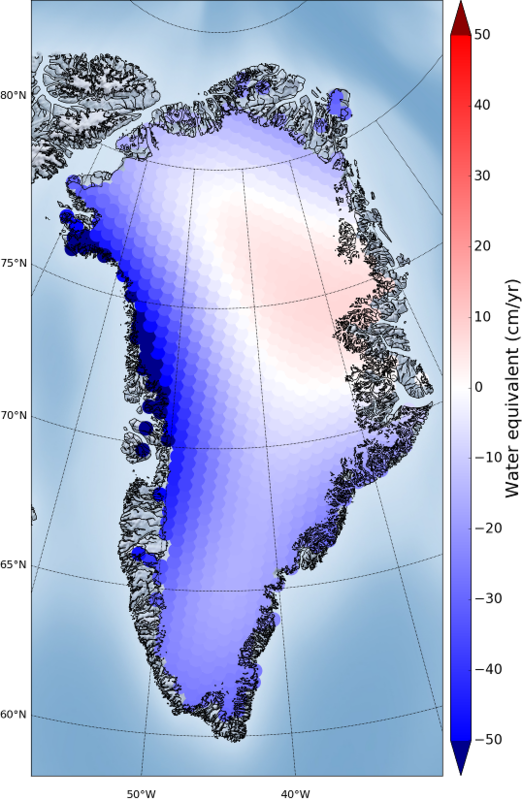 The mass balance of the Greenland Ice Sheet (GIS) can be measured with an accuracy of around 20 Gt/yr. The Greenland Ice Sheet cci produces Gravimetric Mass Balance (GMB) products for the Greenland Ice Sheet from GRACE measurements. These products comprise monthly mass change time series for the entire GIS and different drainage basins as well as gridded mass change trends over different 5-year periods between. We use the ITSG-Grace2016 release provided by TU Graz ( www.tugraz.at/institute/ifg/downloads/gravity-field-models/itsg-grace2016), which includes spherical harmonic coefficients up to degree 90. Different processing algorithms exist in order to derive the required information from the available data for the GIS. The round robin (RR) exercise carried out by TU Dresden has confirmed that the mass inversion and spherical harmonic filtering methods give comparable results. Therefore the GIS GMB setup is primarily based on the inversion method applied by DTU Space, where a direct estimate of mass changes are done in a direct least-squares generalized inverse processing. In addition, a second GMB product based on the regional integration approach using tailored sensitivity kernels is provided by TU Dresden.